"One might expect a book comparing brand relationships to human love would be full of fluffy anecdotes about romantic misadventures and speculative analogies to brand building. While there are indeed a few love coaching stories sprinkled around the book, they aren’t the main emphasis. In fact, Dahlman populates this slender (182pp) but interesting volume with over a hundred end-noted citations as well as her own branding observations from both personal experience and consulting gigs. Long-time Neuromarketing readers will find some of the research to be familiar, but Dahlman provides her own insights and “brand love” perspective." 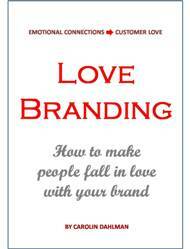 "Love Branding, published privately in Australia, hasn’t received much attention. That’s too bad. Even if one finds the analogy to human love a bit of a stretch, the references and branding examples that Dahlman has collected are highly worthwhile." Population up up up - is your brand prepared? What is a Hipster nowadays? Facebook at the office - Like or Unlike? 50´s - Women are going back to the stove?